Every HPN® is unique, prepared by your special ideas. With our modular system we are able to build each customers dream motorcycle, wether it is for rallye racing, off-road or street use. See how your new bike can be made out of the different assemblies, combined with the accessoires of your choice. 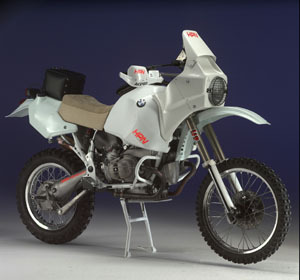 In any case a frame of the BMW R247 (R80G/S, R80ST, R80/100GS, R100R or R80GS basic) series will be the starting point. Each main frame is reinforced. The characteristic of our motorbikes depend essentially on the different type of swing arms, which influences the character and the mission of the bike. The following introduction is only a small summary, so specifications can depend upon the individual owners desires. 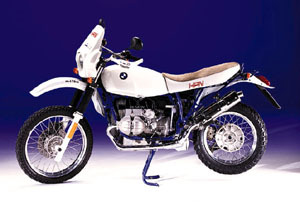 If you are interested in our motorbikes, we offer to improve your BMW or to build a complete new one, based on BMW parts - combined with our improvements. Our customers are from all over the world. If you are from Japan, please contact DOKEN Co., Ltd - 3377-1 Koto, 431-1103 Hamamatsu, Japan for further information. People from other countries are welcome to visit our forum or to write an email direct to info@hpn.de. With the reinforced BMW GS frame, the BMW R1100GS swingarm and the best accessory parts from Brembo, Marzocchi, WP Suspension, Acerbis and HPN we created a motorcycle with superb handling on- and offroad. These have been tested and improved under racing conditions. 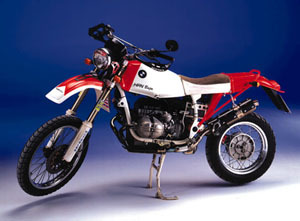 Victory in the 2-cylinder classes of the München-Breslau Rallye 1997, the Rallye Cup 1997, a lot of IGE arrangements and the ADAC Enduro Rallye trophy by the rider Ingo Zahn all showed the capabilities and performance of this motorcycle. The HPN "Sport" 1043ccm is without any compromise destined for racing, and is the reason why it has to be modified in some aspects for use on public roads. 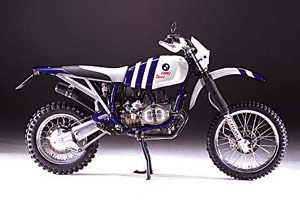 The HPN Paris-Dakar is a copy of the winning bike of Eddy Hau at the Marathon classement Paris-Dakar. It convinces by its performance, easyness to handle, optic and its extreme durability (double swing arm) under all conditions. 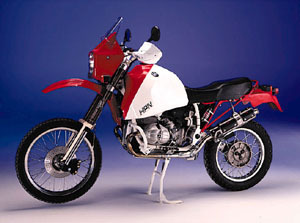 With the reinforced BMW GS frame, the BMW R1100GS swingarm and the best accessories parts from Brembo, Marzocchi, White-Power Suspension, Acerbis and HPN we created a motorcycle with superb handling on- and offroad. Those have been tested and improved under racing conditions. 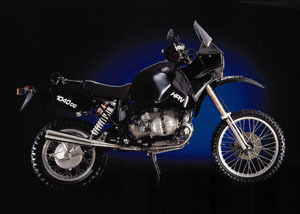 Successful privateer participation at the Paris-Dakar 1997 and 1998 and the Master Rallye 1997 with the legendary rider Raymound Loizeaux (18 Paris-Dakar participant) show the durability of this motorcycle.